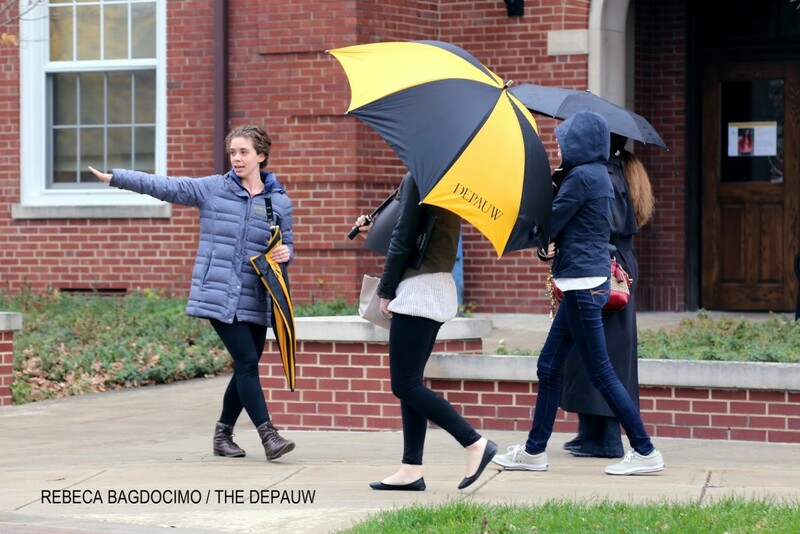 Junior Maggie Wetzel shows prospective students around DePauw University on Monday afternoon. The office of admissions at DePauw University is making the effort to be more transparent and inclusive across the board. Vice President of Admission and Financial Aid Cindy Babington held a round table event last week to share recently compiled admissions data and start conversations as to where DePauw is going in the near future and over the next decade. “I would like to get faculty engaged in understanding really what we're working with here,” said Babington of the event last Tuesday. The fact of the matter is, the majority of DePauw students are from Indiana and Illinois. “[In that area] we are very well-known,” said Babington. In the class of 2019, just over two thirds of the domestic students are from Indiana or Illinois. According to the data Babington presented last week to the faculty, the demographic of college-age students from these two states will shift in the next 14 years. Babington reported a 14.8 percent decrease in white students and a 8.9 percent decrease in black students across the country over the next 14 years. At the same time, students who identify as Hispanic or something other than black or white are reaching college age at a much higher rate over the same period. The national trend appears to be consistent across both Indiana and Illinois. The implication of this information is something that Babington and her team in admissions believe they should be aware of, but by no means does it indicate that Babington and her team see a reason to decrease their efforts in either Indiana or Illinois. Babington believes that a strong recruitment effort in these areas to still be very important. Indiana and Illinois are home to many of DePauw’s feeder schools, and Babington said those students generally excel at DePauw. Frank Hall, Professor of Political Science, and Director of Africana Studies, Clarissa Peterson, were vocal at the round table event, specifically in relation to the diversity of students when it comes to recruiting in Indiana and Illinois. Peterson pointed out that DePauw has come out as a campus in favor of greater diversity, yet she sees the focus of our resources to be going to the same places year after year. Curtis Furguson has been hired on to work directly under Vice President Babington as an associate director of admission to help fill the gap for multicultural recruitment in the admissions process. Furguson is in his first year at DePauw and is still getting acclimated to the DePauw culture. His short-term goal is to gain an understanding of what constitutes DePauw as a University and culture. While his territory is limited to a small section of Indianapolis public schools, Furgeson is here to help counselors and prospective multicultural students from other territories find that fit as well. Peterson suggested that the Posse program cannot be DePauw’s only method to bring in students of color to DePauw and extended efforts must be made elsewhere. The work Furguson is focusing on in Indianapolis is separate from the Posse program. According to admissions data, Furguson said seven of the 19 Posse scholars in the class of 2019 identify as African American. At the same time, Caucasian students make up 73 percent of the class of 2019. One way in which DePauw admissions is looking to combat the change in demographics and become a more inclusive environment is to be more cognizant of the needs of multicultural prospective students. In the admissions process it is important to “be able to articulate what makes DePauw special,” said Furguson. Peterson also commented in a follow-up addressing the idea of fit and inclusion when it comes to recruiting a diverse class. She, like both Babington and Furguson understand that getting counselors to campus is important in the recruitment process. In a follow-up meeting with Babington, she said that last year counselor fly-ins were very successful. With a group from Georgia, DePauw saw an influx of applications from those high schools. Babington plans to employ this strategy even more in the future. Babington also reported that the admissions plans to increase the use of travel grants to bring prospective students to DePauw to actually see the campus. In bringing students to campus, both Furguson and Peterson raised similar points about the importance of an inclusive DePauw culture. “[We need to] create a more inclusive environment on this campus so that our communication with counselors, parents and prospective students will be genuine,” Peterson wrote in an email. According to Furguson, the challenge is up to the DePauw community to define what diversity means to DePauw, who is being invited to the table and to take part in the conversation.